If your business would fail if you were removed from the equation then it’s not a business. If you’re not creating and documenting the necessary business systems and processes you rely on regularly and turning them into reusable templates, You’re missing a trick! When you are a digital entrepreneur you have to wear a lot of hats and often this need to be agile can be overwhelming. Managing 100s of emails, organizing projects, collaborating, blogging, responding to emails. It can quickly become a royal pain in the a$$. However, if you adopt the right business systems into your workflow you can minimize a lot of friction and quickly become hyper-organized. This is by far the best way for you and your business to improve efficiency. So, what’s my secret weapon when it comes to keeping all of the cogs turning and mastering work productivity? 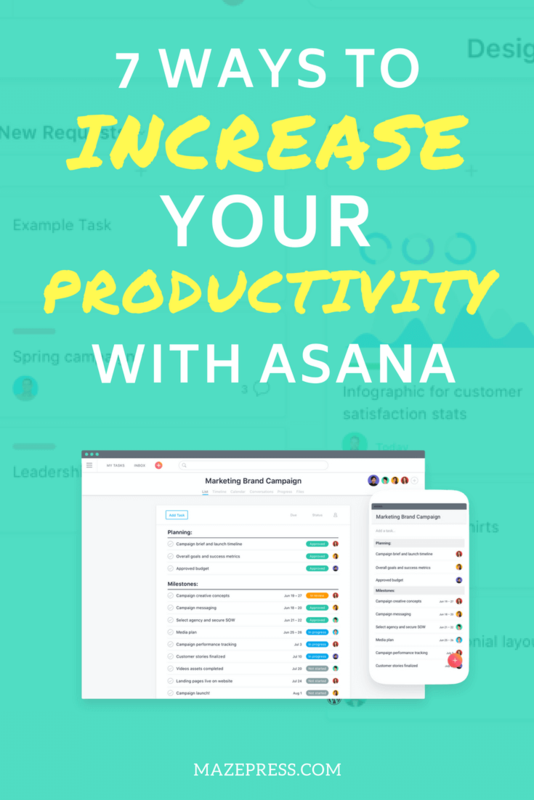 Asana is a to-do list on steroids! But it’s much more than just that. When I tell clients that Asana is the single most impactful tool I have adopted in my business, workflow and day to day, I don’t say that lightly. Asana is what we call an Enterprise Resource Planning tool or an ERP tool for short. Yes, another acronym for you to remember. Enterprise Resource Planning software provides integrated management of core business processes. Project Management + Collaboration and communication on a task and sub-task level. Global Search (This one is powerful and not talked about enough. If all of your projects are in Asana, this search feature becomes the oracle to everything). Some describe Asana as a team working tool but this is misleading because I know so many solopreneurs who mostly use Asana as their way to micro-manage themselves and organize the projects they are working on alone. 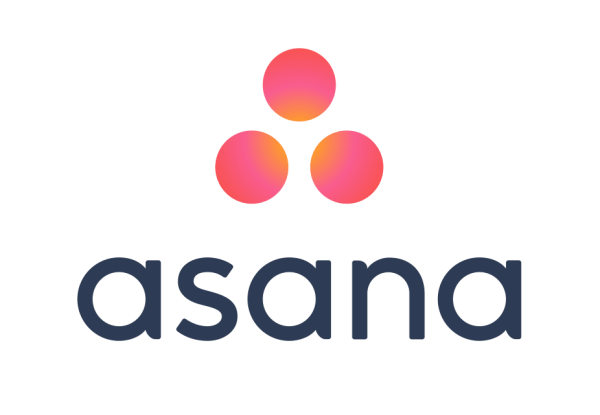 Asana is a simplified tool on the surface yet extremely flexible for any businesses needs and is also capable of some very advanced setups if you opt to use the pro version. 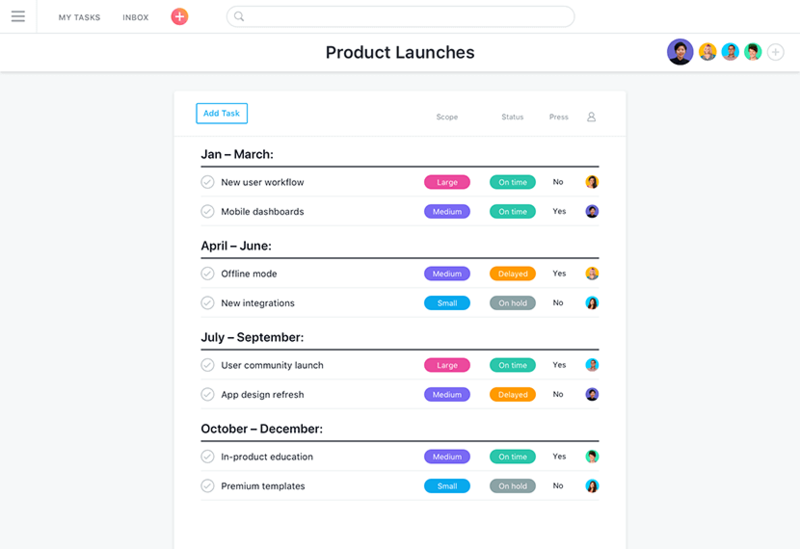 For most people, the free version will be perfectly fine as Asana’s freemium model doesn’t discriminate and force essential features into their premium offering. So what are the practical benefits of Asana for me? Provided me with a tool systematize the processes in my business. Stopped me from missing deadlines. Prevented me from forgetting tasks and nuanced details. Provides a holistic view of my workload. I can see everything on both a macro and micro level. Reduced my procrastination by giving me a single place where all of my tasks live. Allowed me to take on more clients and projects without reaching an organizational bottleneck. Allowed me to retain more information without creating a mess. How was I doing things before? Before I was reliant on a plethora of separate, discombobulated tools and it was a nightmare that prevented me from performing to the best of my abilities. I used Google Calendar as my calendar tool. I used Trello’s Kanban boards for brainstorming and planning. I used Gmail / G Suites for my communications and discussing projects. I used Google Docs, Sheets and Drive for file storage, listing out ideas, to do lists and for other purposes. Ultimately this was a lot and this fragmentation worked against me. Now the majority of the above processes are all managed inside Asana. I only use Google Drive for what it’s good for. Some documentation, spreadsheets and file storage but I have this connected to my Asana for ease of access since Asana offers a range of integrations and Google Drive is, of course, one of them. I manage my tasks on a calendar and switch between the task list and calendar views in Asana to replace both Google Calendar and my archaic to-do lists. Before I used the calendar for essential deadlines and meetings only. As for the brainstorming and planning I used to do in Trello, that is now easily handled by creating a “boards” project in Asana. Trust me, when it comes to Trello vs Asana, there’s only one winner, and it’s not Trello. 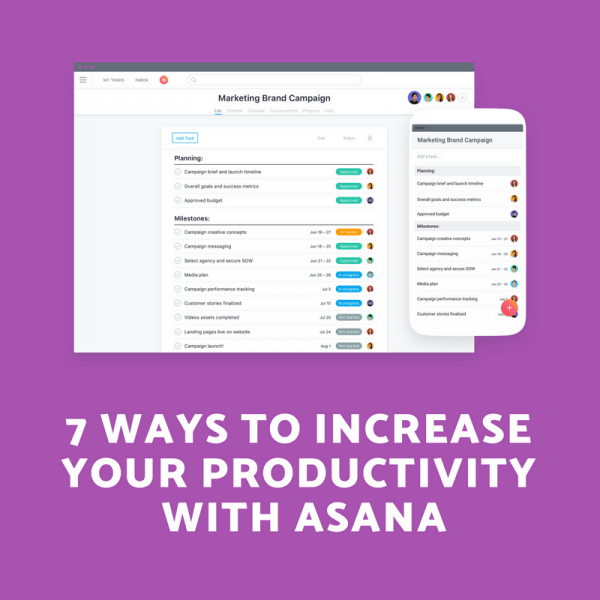 Let’s take a look at some of my favorite ways to use Asana to be more productive and efficient in your business. Here are some examples of ways you can use Asana to make your work-life easier with additional details on how to use them. Email is great until it’s not. While Email is a fantastic tool and one of the pillars of the internet and free speech, it’s also become a tool that businesses often rely on too heavily and use for things when there are better alternatives. Let’s face it, we all get anxiety when we look at our inbox and it’s full of emails. You see a subject line and preview but for all you know, each one could be a 5000-word essay with maybe 20 different questions and topics. Then you have to reply, quickly switching your focus up and down as you reply to each point, or if you have ever had a convoluted email exchange with me it usually turns into me replying in different colors under each point to keep track. All of this creates a mess of emails with details being repeated or lost. When you take the conversation over to Asana and each point of the email becomes a task you can focus on each item one by one and mark them as complete when they are no longer relevant or actively being discussed. This means you never miss details, avoid repetition and remove the noise. You can invite multiple people to a task to respond and take over, assign to someone else in your team and add separate deadlines so you start to build an order of priority for your project. I often use Asana to manage projects with clients too, so technically replacing external emails, but I only do this for clients I have an ongoing relationship with or when we need to work on a project with lots of moving parts and as such lots to discuss. One of the best ways to be consistent with your content creation is to use an editorial calendar, and while you can use WordPress plugins I personally think Asana is more flexible. 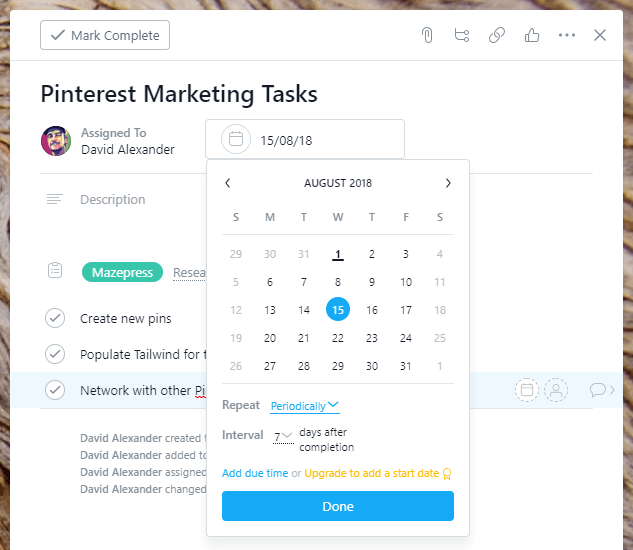 For example, in Asana I can create a Workspace or Team just for the Editorial Content Calendar, then I can create a project inside it for each medium. Each project is given a unique color and I can look at the overall Workspace or Team calendar to see all content types or mediums on a single calendar to plan the weeks or months ahead. This can be a great way to plan out what you intend to publish over the coming months and ensure you get notification reminders and can use it as a way to stay on track with your goals. There are certain business processes that are ongoing and neverending. Every business has a certain number of these tasks that need to be completed or checked off on a recurring basis. It could be something like paying the bills, producing a weekly sales report or remembering to spend 30 minutes each week applying for freelance writing jobs. With Asana you can set up recurring tasks that repeat periodically after they are completed. You can choose all sorts of intervals like X number of days, weeks, months or on certain days of the week or calendar month. Setting up your recurring tasks in this way makes it much easier to keep on top of these ongoing systems in your business. So if you are working on anything longterm or in intervals start using this feature now and it will make it much easier to stay on course. If you want to create consistently good content for your website or blog and intend on taking on other writers to contribute, it’s vital you have a blog post process. 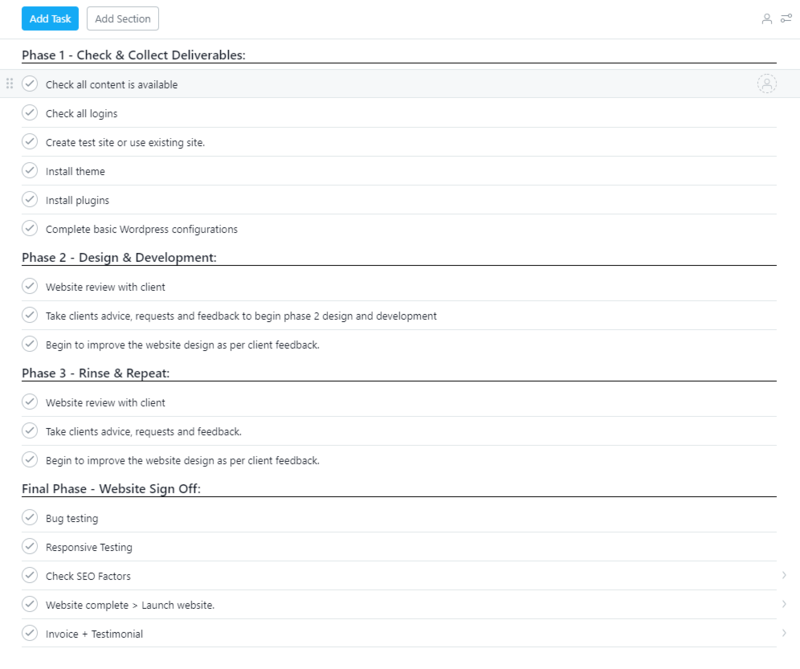 Creating this process in Asana means you can duplicate it each time and work through the steps top to bottom checking them off as you complete them. You can also assign an entire project to one of your writers and have them work through it as they produce, edit and publish content on your site. Or it could include more comprehensive steps like in our blog post checklist. While Asana isn’t a CRM and doesn’t offer the features required to properly manage customer relationships it does provide some of the tools necessary for tracking your sales pipelines and where leads are currently positioned. You can create an Asana project, and either set it as List View or Kanban Boards. If you opted for list view then you can create different pipeline stages by adding a colon to the end of your task name. Below is a photo of how this would look in list view. With Kanban boards, you can create different columns for the various stages of your pipeline as you can see in the below example. You can create all sorts of different pipelines with Asana to help you visualize your business activity and workload. I also create a production pipeline. Once a project reaches the end of my sales pipeline which is the stage called “in production” they get added to the production pipeline where I track their progress from the start through to completion and invoicing. You could use this Kanban board view to illustrate all sorts of stages that help you visualize the progress of a project. The next time you are working on a project with a client that involves lots of individual tasks and will last more than a week or so consider using Asana. Create a workspace for working with clients and then create your new project. Setup the project outline with the necessary steps and tasks that are required with additional details using descriptions. Then invite your client to the project using their email address and once they accept the invite email you will both be able to discuss and collaborate together. You will have access to all projects, your client will be confined to the project you invited them to. You can assign tasks to your client like the deliverables you need to get started and assign other tasks to yourself. Optionally you can then add dates to different tasks though I tend to only do this for key tasks and stages. Rather than spending half of your time stuck in your inbox going through exhausting emails you can quickly break down and discuss each aspect on a point by point basis in Asana. You can also share access to files, important links, and resources, invite other collaborators and track your progress. Those who do decide to upgrade to the premium version will also benefit from power features like dependencies, which provides the ability to require certain tasks be completed before others become available to work on. Another great feature is custom fields which affords you total control and flexibility over the input fields of each task. This is what makes Asana extremely flexible. One of the most taxing aspects of scaling a business is human resources and especially onboarding new talent. If you are a solopreneur or remote worker who lacks systems to ensure the onboarding and training process is smooth and efficient this issue will be exacerbated. When you create training resources for your team inside Asana in the form of an actionable task list that you can duplicate over and over for each person things are considerably easier and both yourself and the person you are training can always refer back and re-complete the steps. If I am onboarding someone to Asana I start by giving them a series of 5 tasks that help them learn how to use Asana. Often this is in the form of a new project named “Learn Asana” in their workspace. After going through the above and spending a little time practicing it’s easy to start getting to grips with Asana and seeing the benefits. Once you have created task templates for every business process you need someone else to do on your behalf you will never need to write and send instruction emails again. If you are planning a product like an ebook, digital course, a piece of software or a SaaS product then there’s no better tool for researching, brainstorming and planning your idea than Asana. With Asana you can compile all of your research and features as tasks or sub-tasks and invite your collaborators to help you discuss and vote on their merit. 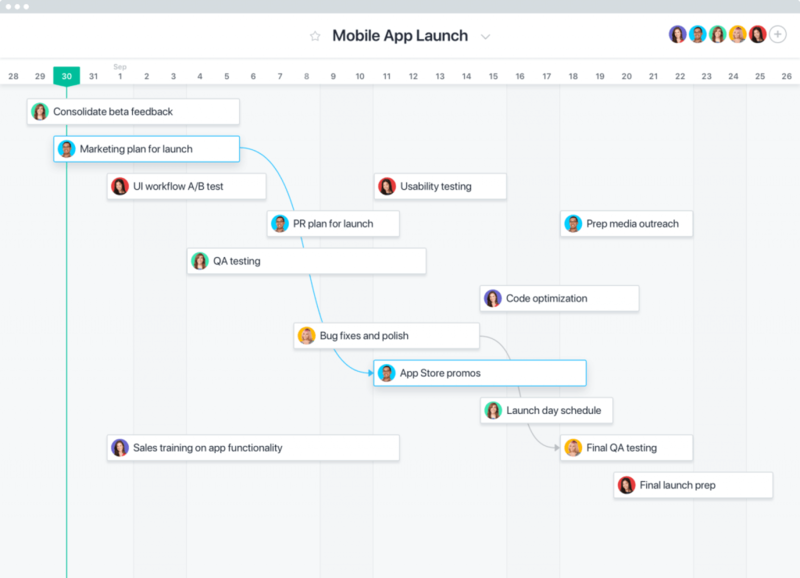 You can create a timeline of your production and launch schedule. Have a product in the idea stage? Why not create a product validation checklist to help you ensure the idea has legs. If you are creating software or SaaS tools you can use Asana to track bugs, issues or your progress. When creating eBook you can plan out your chapters and the subtopics you intend on covering and organize them before you start. Once you are ready to launch your product, create a launch checklist or download one from Templana and to ensure a safe lift off. There are so many ways you can use Asana to help structure your processes when creating your own products. Each business and individual is unique and will have different systems and processes that take place on a regular basis. And pretty much anything that could benefit from being turned into a checklist. Next, you want to take each process starting with the most important and break it down into the necessary steps. You can do this on paper to start with but I like to do this directly in Asana and create a task for each step and use divider tasks to group stages of a process. 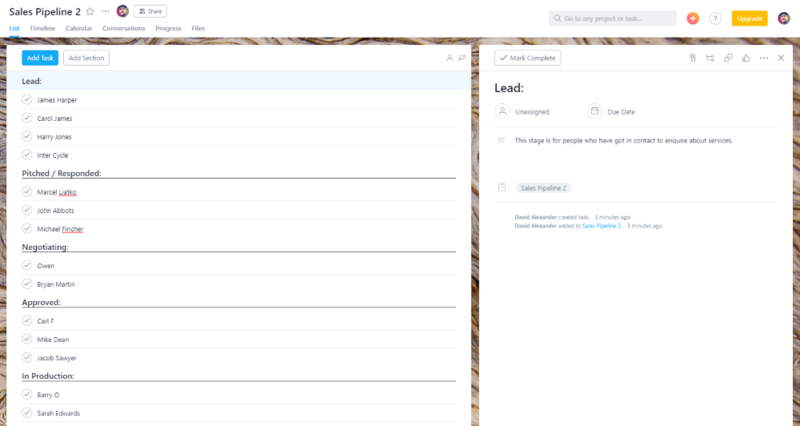 To create a new system in Asana you want to create a new project in your workspace. So you can reuse it call the first instance of each “Template: Template Name” this way you can duplicate it when you need to use it and always keep the original copy in it’s original condition. On each task in an Asana project, I keep the task names simple and add the details of each step as the description. This helps to keep things looking tidy. If each task needs to be broken down further then you can use the sub-tasks to add additional parts to each step. Let’s look at an example process for a web design project. The above project is a template I duplicate everytime I start a new website and many of the visible tasks contain more specific sub-task. I can then systematically work through the list which is conveniently broken down into the main stages with dividing tasks until the project is complete. Doing so helps me make sure I can work coherently, and without wasting time thinking about which step is next or if I missed anything out. Once you have all of the details fleshed out for your new process checklist, you have added detailed descriptions as though you were training a new employee on how to replicate what you do and you have added any necessary subtasks you can look at how to refine your system. Eliminate – Can you eliminate the task/step? is it absolutely necessary? Automate – Can you automate this step so it takes little or no time. Delegate – Can you delegate this task so you can spend time working on more pressing matters. If you can eliminate the step then remove it altogether. Question what it offers to the big picture. If you can’t remove the step altogether but you can automate it then you may need to keep it in your task list as a reminder in case you need to initiate the automation flow. Remember there is such a thing as semi-automation and it can often deliver better results as it appears more natural. If you can’t eliminate or automate, then is it a task that is worth you delegating or teaching a VA how to do. This can free up your time to work on growing your business. Remember you need to work on your business not just in your business. If you can’t refine the process with any of the above approaches or don’t want to allow anyone else to do it then you may still be able to find ways to make things more efficient over time and through repetition and as you do you can update your process in Asana. Bookmarks, as a replacement for Evernote. Do you want pre-built templates that you can use straigtht away? 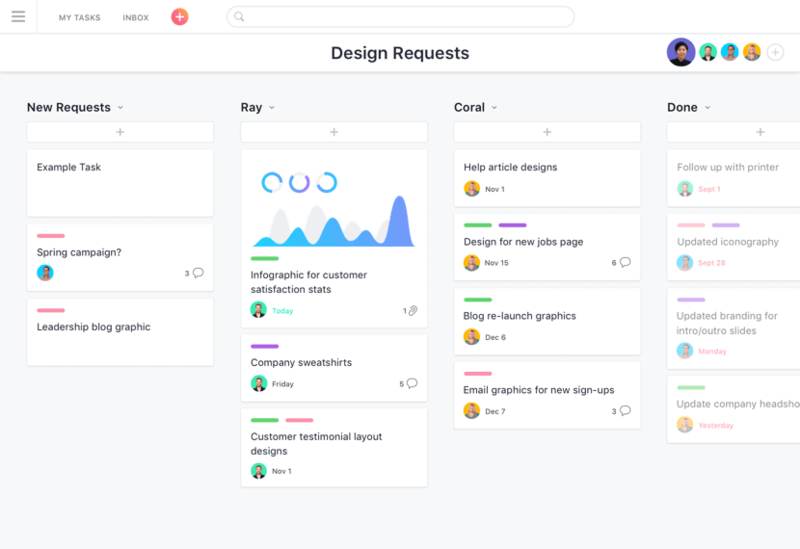 Templana is a website that has put together a long list of different project templates for Asana that cover a lot of systems digital creatives and entrepreneurs use frequently. These cover everything from personal finance and starting a blog through to prototyping ideas and life management. What system are you going to create in Asana? I’d love to hear from you. There’s no limit to the number of things you can organize using Asana and above are just examples that I use. I’m confident if you take your existing approach which might be working from your memory or a task list written down in a word document and convert over to using an enterprise resource planning tool like Asana you will never look back. There are lots of other ways you can improve your productivity so make sure you check out my guide covering all of the productivity tips and tricks I use to remain as efficient as possible. There are other great alternatives to Asana that I have used however to this day I still haven’t found one that beats it for small enterprise and individual use. If you are a blogger, freelancer, website builder or anyone that works on a computer or smartphone I strongly recommend you add this tool to your business stack today. If you ever feel that disorganization is the reason behind your procrastination and lack of productivity and you aren’t using Asana then it’s time to make a change and give it a try. In this article we talked a little bit about when using Email isn’t productive, I have also written a comprehensive guide on productivity hacks for email that’s worth reading while you are here.